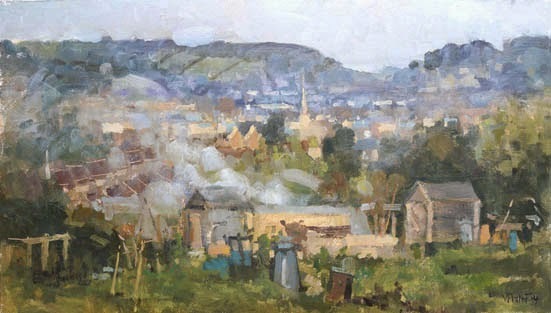 I have been out painting in Bath again which is great fun. With a little baby waiting at home, it now takes a bit more organisation before heading out, but it's doable! 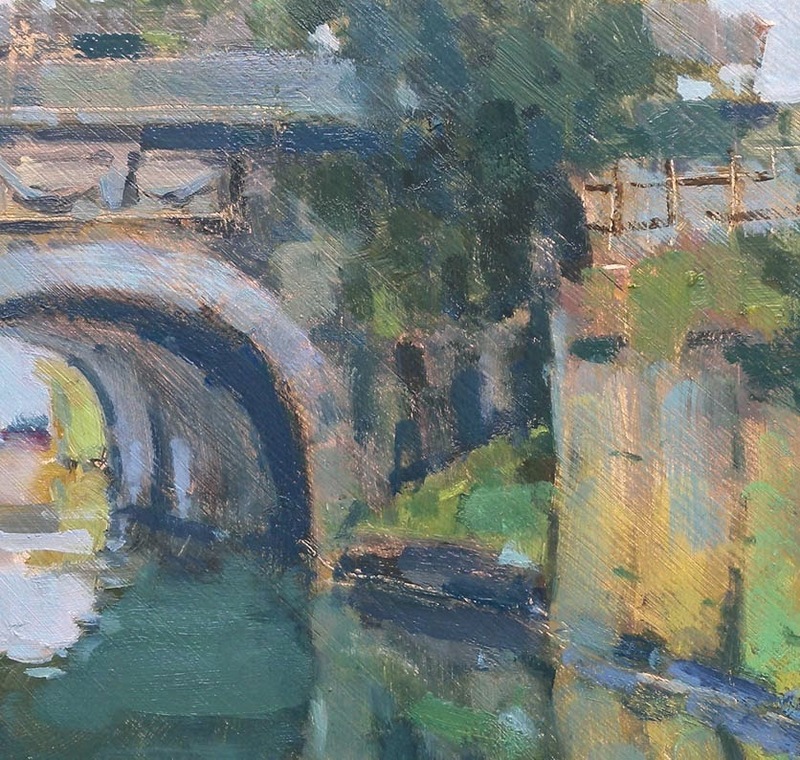 The painting below was my first plein air session in Bath since the baby's arrival. I can't say it went smoothly but it certainly was an interesting experience! Let me explain: It was planned that I would have some time to paint on Sunday. Although I woke up to pouring rain, I didn't let it stop me as I wasn't sure when I would get a chance to go out again. As a first painting I could have picked a nice spot around the corner. Oh no, for some inexplicable reason, I decided to take my bike with all my gear, in the rain, and get to the other side of town, right across the annual Bath half marathon! When I was finally set up, I only managed to get 3/4 way through my painting before receiving an urgent call asking me to come back. "She's hungry", my partner said... So basically I had to give the final touches in the studio! 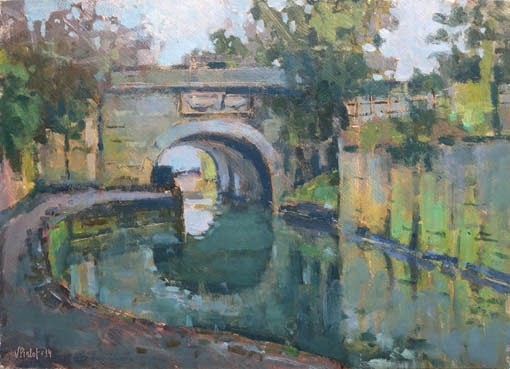 Below is my second attempt of plein air in Bath this year. 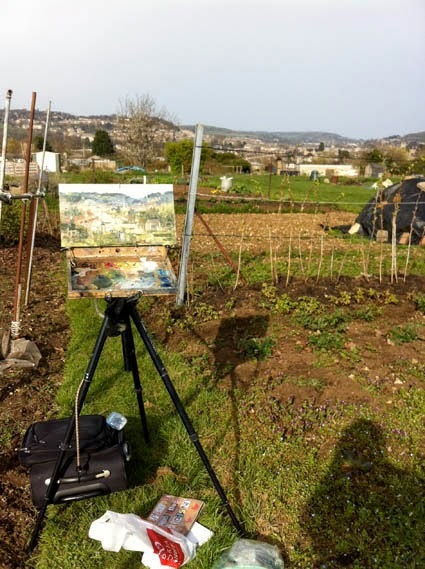 I discovered a beautiful spot with allotments and great views over Bath, just 5 minutes walk from my house. It was a sunny misty afternoon which gave a lovely purple fog in the distance. 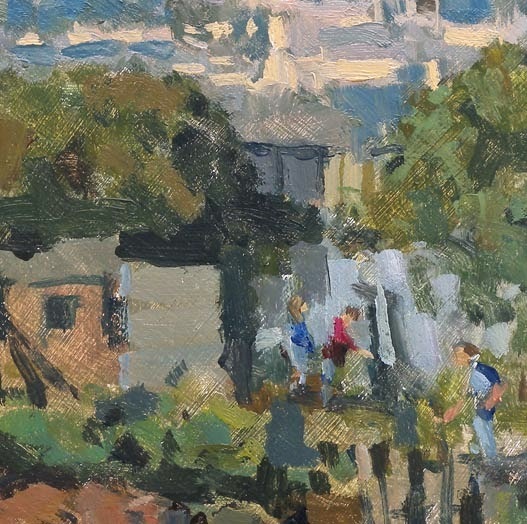 I liked painting the bonfire too which adds a nice feeling of movement to the composition I think. The positive thing, is that I will never get big headed with such a partner! Anyway, I ended up being quite happy with the result, I hope you like it too! 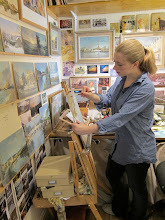 So lovely to see you painting again, even if it takes a lot of organisation! I love your work, so I hope baby Louisa lets you have a bit of time so we can enjoy your paintings! Thanks Sheila! Glad you enjoy the blog. I suppose the question is not whether Louisa lets me go but how often my partner is happy to do babysitting;) He is quite good though so hopefully I'll be posing many more paintings soon! These are great. 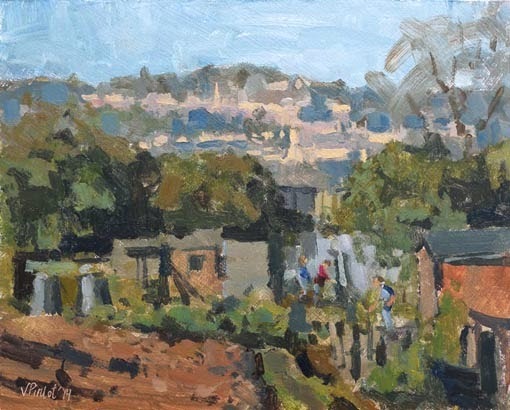 I think the allotment paintings are always really interesting and some of my favorites. 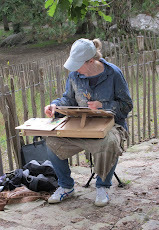 It is so great that you are still able to paint outdoors. 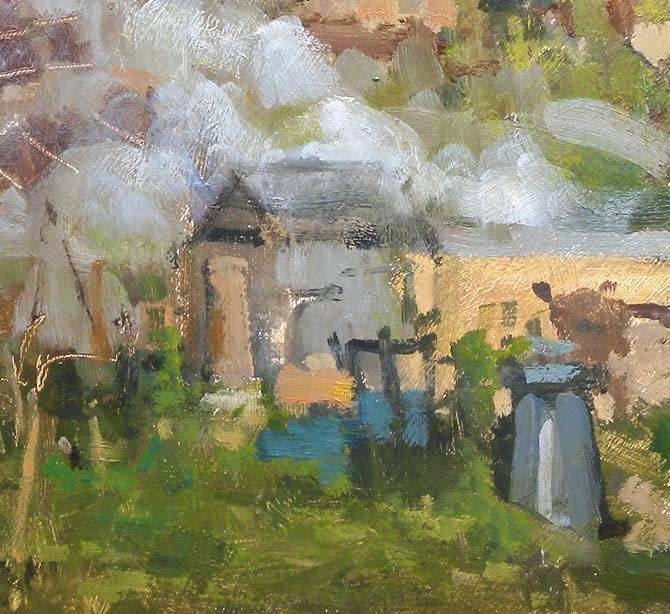 Are you doing any painting in that beautiful studio of yours, or did it turn a nursery. Thanks Douglas! Yes I have been using the studio a lot recently. Louisa is quite good at napping so I now try to paint every morning in the studio. I will be posting my studio work soon. I hope you're well.